Sylvia & Aki by Winifred Conkling. Review: What is it like to be treated unfairly? 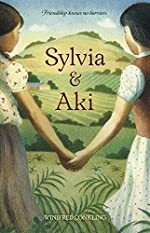 Sylvia and Aki, a novel written by Winifred Conkling is a book of friendships, differences and hardships. I truly enjoyed reading it! Sylvia, at age ten just loves school, while Aki at age 12 only wanted to stay on her family's farm. Winifred created a book with feeling just seeping out of the pages! Sylvia, just moving onto a farm has only one wish: to go to school. When she is forced to go to a Mexican school down the street from the white school that has bad supplies and unqualified teachers she feels hopeless. Meanwhile Aki is forced to move out of her farm because of the war. Aki is Japanese and has to go to a camp until the war is over. Both girls fight to try to get what they want while they think nothing is worse than being different. These differences soon seem to pull them closer together and into a friendship. What I loved about Sylvia and Aki is that you can really step into the girls shoes and feel their emotions. This novel informs readers about what it was like for people in different time periods. Aki was forced to live in a small house with many people while Sylvia was forced to go to an old, unprofessional school Reading historical fiction novel, will teach readers that you can learn some valuable lessons that can make a difference in your life. I would say it is an appropriate book for children between the ages of 8 and 10. It is really an exceptional read that I enjoyed immensely! We would like to thank Random House for providing a copy of Sylvia & Aki for this review. Have you read Sylvia & Aki? How would you rate it?